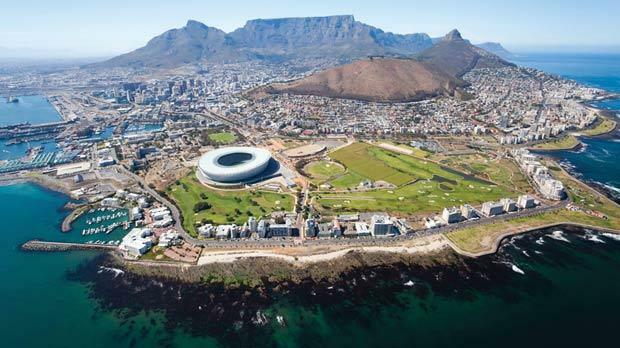 View of Cape Town, with the World Cup stadium in the foreground. 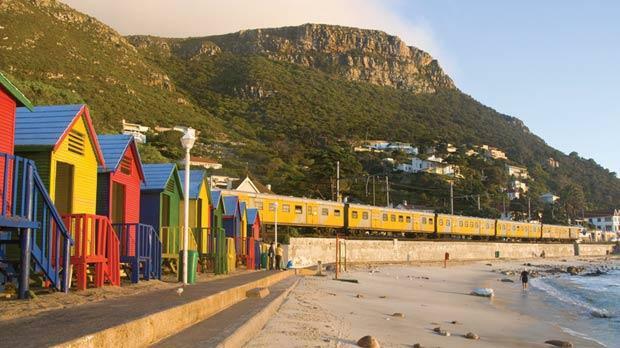 Colourful beach shacks near Cape Town. 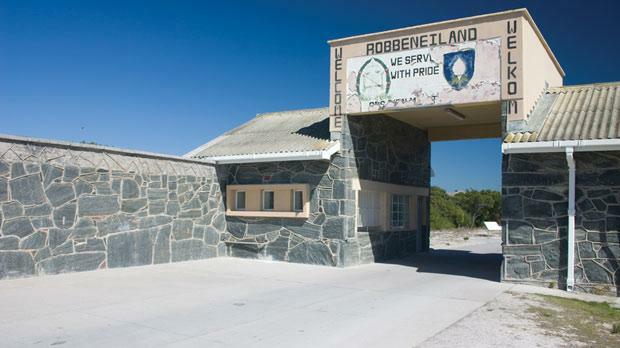 Robben Island, where Nelson Mandela was held captive. Slowly we walk between makeshift shacks of wood and corrugated iron. Two old women dance into the street as the unmistakable music of Africa plays on a stereo. Everyone who visits Cape Town has a favourite memory. It might be summiting the peak of iconic Table Mountain, partying in Long Street, reliving Mandela’s years of incarceration by visiting Robben Island, or diving with great white sharks. 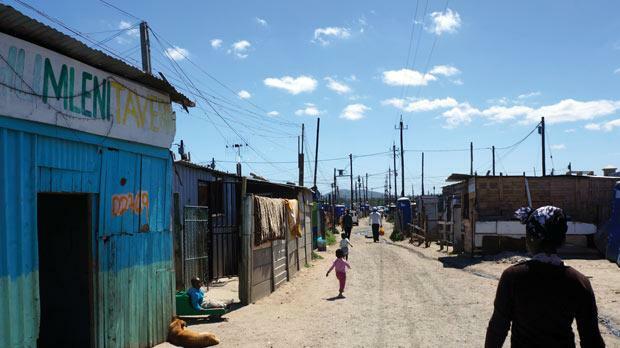 But it’s equally likely to be experiencing the city’s underbelly, taking a tour through a township and seeing the lives of the people who define the city. There were a couple of interesting curio markets, the odd colonial building, and a gang of child street performers in Zulu outfits. But everything was overshadowed by Cape Town’s iconic image. Rising almost vertically from the ocean, Table Mountain is a startling expanse of rock that stands over the city, a ubiquitous image whenever I look up. After walking skyward for over a kilometre, I’m rewarded with a different view of the city. On one side is the shimmering Atlantic, next stop Antarctica. Beneath me the coast curves north, plotting a path through the city’s sights: the dazzling World Cup football stadium; a seductive waterfront of affluent bars and fish restaurants; Kite Beach, the world’s premier destination for kite surfers; and a dozen secluded beaches tucked on the deserted road north to Namibia. 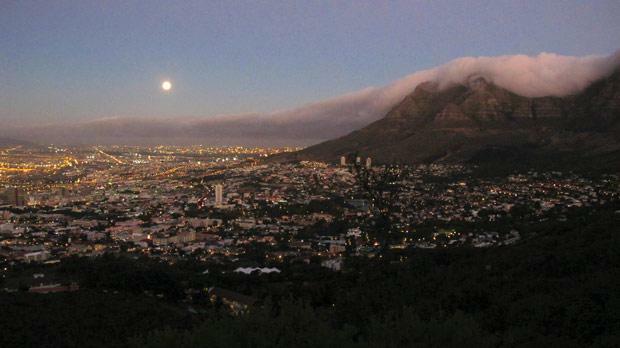 Cape Town benefits from space. 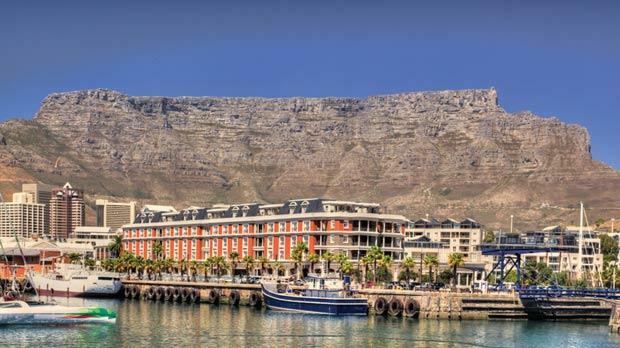 Located on the southwestern tip of Africa, the city has gradually expanded, slowly flourishing along the coast and away from the mountains. As a waterfall of cloud begins its daily plunge over Table Mountain, I start my descent. First comes the sunset, enduring lines of yellow and red that take an eternity to drop from the horizon. Slowly the city lights come on, a million yellow dots spreading out, until finally the resplendent moon rises high, dappling through a forest of pine trees that completes my two-hour downhill journey. Walking down into the city I’m in Long Street, Africa’s most energetic nightspot, a never-ending row of parties, live music and drinks offers. People have brought their own traditions and set up camp: The Dubliner, an Irish pub with live gypsy folk music; the xylophone and percussion music of a hangout for Zimbabwean refugees; The English Red Lion for real ale and pork scratchings; and Mama Africa, five different meats on one plate and a man playing the bongos. Cape Town has forever been a city of settlers. Dutch, Portuguese, English and French ships started coming in the 16th century en route to India. The Dutch and English settlers then fought over it for a couple of centuries, until finally it was given back to Africa. Botswana, Malawi, Australia, Europe, it’s still a city that attracts people from across the globe. There are fragments everywhere, diminutive pieces of each person shaping the city, changing it every day. It’s one of the few places in Africa that attracts international expats and those from its own continent. Besides a township, Mzolis has become a Cape Town institution. It’s before midday and the tables are already packed with a mixed crowd. Fervent entrepreneurs fuel the party, selling beer in cardboard boxes from their shacks across the street. The Mzolis butcher serves up large metal trays of barbecued meat, plonking a few kilos of lamb chops and boervous sausage onto my table. As the meal ends the dance floor fills, a succession of DJs pushing a throbbing sound system with deep rhythmic music. I walk through the crowd: a French hippy, two Kenyans finishing a bottle of Johnnie Walker, a dozen jovial Zimbabweans, a dancing blonde Swedish girl, and a smattering of others from Cape to Cairo. Beer, barbecue and bass: three obsessions that unite the Cape Town diaspora. But for all the variety, I feel like I’m missing something. What about the real residents? Fifteen kilometres north of the city, Table Mountain still stands imperious and tall. 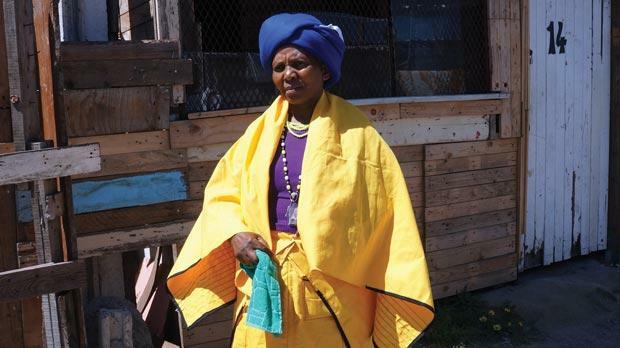 Sbongile has been guiding tourists for two months now, showing them around the assortment of shacks that constitute the Dunoon Township. Our first stop is a shebeen, where strong home-made maize beer costs €1 a litre and is served in tin jars. Now we’re walking into the heart of the township, past the woman barbecuing cows’ intestines, inside the Zion church constructed from scrap metal, and out onto the fields where Sbongile demonstrates how to make a carpet from cow dung. Townships are located on government land and are run by a committee of community leaders who must grant permission to anyone wishing to build a new shack. Every fifth house doubles as a shop, where residents find something to buy and sell to get by; spinach here, phone credit there, bread, beans, biscuits and pens. From the outside Dunoon looks like chaos, shacks haphazard and improvised; everything broken and recycled. But once inside, the shacks are homely and neatly-arranged, the meagre space maximised so a whole family can live in a single room. Water taps are communal but Dunoon has recently celebrated all the shacks getting electricity. The tours were set up by a local non-profit organisation as a means of generating income for the township. For four hours I walk around, being invited into homes, seeing the little businesses people set up to get by, but not once do I feel unsafe. Like Sbongile says, it is not like what I thought. But that is Cape Town’s trick. For all the must-see experiences advertised by the tourist board, it’s what lies off the beaten track that provided my enduring memories.